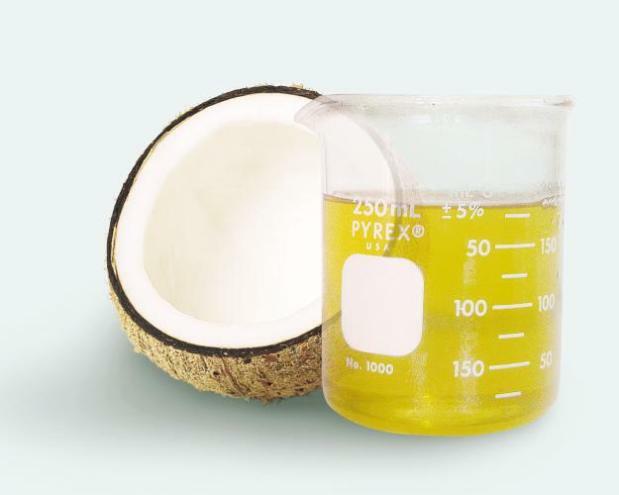 Coconut oil is an essential ingredient in many of the bath soaps, moisturizers and hair oils that you get in the market. You get coconut oil from the kernel of the mature coconut. This oil is rich in Vitamin E and fatty acids like myristic acid, lauric acid and capric acid. As a result, coconut oil has anti-fungal, anti-bacterial and anti-oxidizing properties. No wonder this oil is known as the ’Wonder oil’. If you are suffering from any skin infections, apply coconut oil on the affected area twice daily. This will reduce the pain, irritation and redness on the skin. This is because coconut oil has anti-bacterial, anti-fungal and anti-viral properties. The thin layer of coconut oil prevents any microbes and dirt from getting access to the infected part of the skin. This oil is good for treating psoriasis, dermatitis and eczema also. Coconut oil is used as a base in many of the massage oils that contain essential oils like lavender oil, wheat germ oil, jojoba oil etc. It is a good choice for massaging your body regularly as it is light and has a pleasant smell. Moreover, it is very beneficial for the skin and has no side effects. Presence of active antioxidants in coconut oil helps in the regeneration of skin. So apply coconut oil regularly on your skin and this will heal the skin cells that get damaged. This oil enhances the flexibility of your skin and moisturizes your skin from within. Coconut oil is a good natural sunscreen with SPF 4. It has a small molecular structure, due to which the skin can easily absorb it. So it is used for curing minor burns and rashes as well as sunburns. Coconut oil is therefore an unavoidable ingredient in many of the sunburn lotions and creams. Applying this oil on the affected area provide great relief. Coconut oil is a rich source of fat and therefore a major constituent in many of the skin creams and skin lotions that you buy from the market. It has 90% of saturated fats and as a result it is excellent for providing you a healthy and moisturized skin. Vitamin E is also found in good quantities in coconut oil, which helps in keeping your skin smooth and soft. If you have dry skin, apply coconut oil daily and soon you will see the change it makes to your skin. Coconut oil is a rich source of antioxidants and this helps your body to fight against the harmful free radicals that are formed in the body. As a result, the appearance of wrinkles and fine lines on your skin is greatly reduced. Every day, before you go to take your bath, massage your skin with coconut oil. This will prevent premature ageing of the skin and keep you looking young and glowing. Coconut oil can also lighten the age spots on your skin. If you have dandruff in your hair, coconut oil is the remedy for it. Whether the dandruff is caused due to fungal infection or dryness of the scalp, you can apply coconut oil to treat it. It can lock the moisture in your scalp and is also a good antifungal agent. To get rid of dandruff, massage your scalp with coconut oil and let it stay overnight. You may also add three teaspoons of lemon juice to the oil. Wash off the next morning. Apply this regularly and you can get rid of dandruff. Coconut oil has the power to condition your hair deeply. Applying coconut oil can prevent moisture from escaping from the hair and also prevents the loss of protein. By penetrating deeply into the hair shaft and the inner layers of the scalp, coconut oil can make your hair smooth and lustrous. If you have dry and frizzy hair, coconut oil is the perfect oil for you. Hot oil treatment once or twice in a week can work wonders for your hair. Applying coconut oil on your hair can make your hair follicles strong as well as increase hair growth and breaking of hair strands. You can also prevent split ends and treat damaged hair. Every day you can apply coconut oil on your hair. This will give you the best results. You can also include coconut oil in your daily diet. Coconut oil is also good for getting rid of lice. Mix coconut oil with apple cider vinegar and apply it on your hair. Leave it for an hour or two and then wash off with mild shampoo. This can help in getting rid of lice from the hair. You get two types of coconut oil, which are refined coconut oil and unrefined coconut oil. Refined coconut oil has no taste or odor. You can use this oil for cooking as it is not affected by high temperature. Unrefined oil is also known as virgin coconut oil. This oil has a pleasant taste and it also has a good odor. It is an important ingredient in many of the cosmetics and creams that you use. You can select the coconut oil according to your requirements. How to store coconut oil? Coconut oil is stored in sealed bottles. Once you open this bottle, you can store it in the refrigerator. This way you can keep it fresh for as long as 6 months. When you store the oil, you must take care to keep it in dark places as keeping it in the sunlight can damage it. Always remember to keep the lid of the bottle shut as oxygen in the air may react with the oil and break it down.